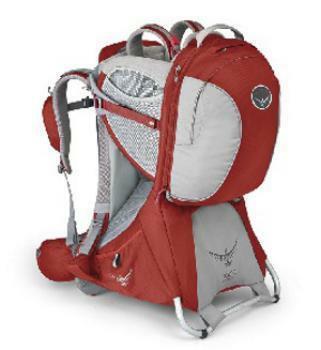 Osprey Child Safety Products and Osprey Packs of Cortez, Colo., is recalling about 88,000 Poco child carriers sold in the U.S. and Canada. The firm has received four reports of children falling through the carrier leg openings, resulting in one report of a skull fracture and one report of scratches to the head. This recall involves all models of Poco, Poco Plus and Poco Premium child backpack carriers manufactured between January 2012, and December 2014. The nylon child carriers were sold in three colors: “Romper Red,” “Koala Grey,” and “Bouncing Blue,” and have a metal frame and a gray padded child’s seat inside. The production date is stamped on a black label sewn into the interior of the large lower zippered compartment on the back of the carrier. Recalled carriers have a production date code of S12SBPR1, S12SBPR1B, S12SBPR2, S12SBPR3, S12SBPR4, F12SBPR1, F12SBPR2, S13SB IPO, S13SBPR1, S13SBPR2, S13SBPR3, S13SBPR4, F13SBPR1, F13SBPR2, F13SBPR3, S14SBPR1, S14SBPR2, S14SBPR3, S14SBPR4, S14SBPR5. “Osprey” is printed on the fabric above the kick stand. The model name is printed on the back at the bottom. The carriers, manufactured in Vietnam, were sold at REI and specialty outdoor stores nationwide and online at Amazon.com from January 2012, to December 2015, for between $200 and $300. Consumers should immediately stop using the recalled carriers and contact Osprey for a free Seat Pad Insert for use along with the existing safety straps to secure the child in the carrier. Consumers who previously received and installed the free Seat Pad Insert in their carriers are not required to take further action. Consumers may contact Osprey toll-free at 866-951-5197 from 8 a.m. to 5 p.m. (MT) Monday through Friday, by email at pocoseatpad@ospreypacks.com or online at www.ospreypacks.com and click on “Poco Safety Notices” on the navigation bar at the top right hand corner of the page for more information.